Branson Travel Agency and its parent company, Branson Tourism Center, are the market leaders in providing extraordinary and affordable deals on Branson vacation packages. We have established excellent relationships with the area's top shows, attractions, lodging properties, restaurants and other suppliers that allow us to deliver deep discounts to our customers. In addition, we have been awarded the 2017 Torch Award for Marketplace Ethics by the Better Business Bureau of Southwest Missouri. We are the 1st Branson business to win this coveted award. We offer our customers full service travel accommodations with NO SERVICE FEES. You read that right! Branson Tourism Center customers pay no service fees for airline tickets or car rentals. Whether you're a single flyer, a family, or a large or small group, our airline reservation system finds the very best prices available at the time of booking. We work with all major and independent air carriers. Choose your favorite carrier or let us find you the most affordable and/or convenient options. Or, tell us what's most important to you when flying, and we'll find the best airline to suit your needs and travel dates. We book all the area regional airports that are an easy drive to Branson, including St. Louis, Kansas City, and Springfield in Missouri, Little Rock in Arkansas, and Tulsa in Oklahoma. As a Branson Tourism Center customer, you'll work with experienced travel agents, here to assist you from the time you book your trip to the time you return home. We have a car rental agency partner that offers highly competitive daily and weekly rates at each of our servicing airports, and Branson Tourism Center customers are eligible for an additional discount; however, we'll also work with all agencies to find you the best deal on your car rental. 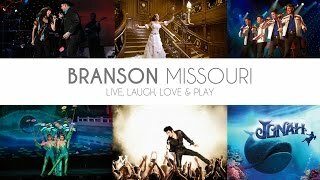 One call is all it takes to book your Branson vacation with Branson Tourism Center. Branson Tourism Center and Branson Travel Agency are there, standing by to make booking your Branson Vacation easy.